Don't spread the word! Three-day weekend. House party. 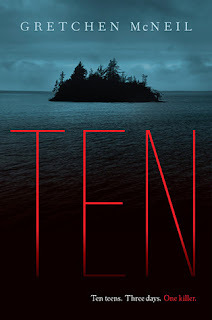 If you're a fan of the typical teen horror movies (Scream, I Know What You Did Last Summer) then you will appreciate Ten by Gretchen McNeil. This book hits all the exciting, suspenseful moments you're hoping for, without being too complex or in depth. It isn't very often that a book actually reads like a movie. I mean, I know you can often see the things you read in your imagination, but with this one, I could almost hear the creepy music and see the hand or cat or bird jump out and scare me. When they walk into a room and see one more red slash on the wall, I hear the loud noise they play in those horror movies to make you jump. Do you know what I mean? I actually feel like I watched this, instead of reading it. Yeah, fortunately, or unfortunately, depending on what you like, Ten was full of teen angst. I can't say I'm a huge fan of the drama, but it definitely made me want a lot of those teens to be offed....which may have been the point. I guess it makes you feel a little better about a houseful of teens being killed if they're a bunch of whiny jerks, and they were a bunch of whiny jerks! It never ceases to amaze me that two people falling in love can kiss in any circumstance. Oh, someone just got stabbed in the back? Well....let's make out! Hey, it might be the end of our lives! It's now or never, right? What's worse is that I was actually begging for it. I was like, "If something happens to these two, and they never get a chance for a good kissing session, I'm going to be pissed!" Luckily, I was not let down. I love how part of you wants them to get together, and part of you is wondering if one of them is actually the killer. That'll add some tension to a relationship! 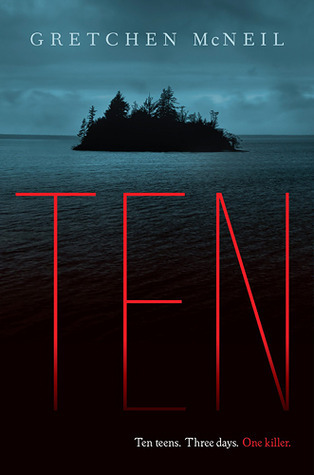 Ten was nothing groundbreaking or earth-shattering, but it was a fun, quick, and creepy read. I did prefer Gretchen's previous book, Possess, to this one, but I did still enjoy this book too. Love this review. You said everything I was thinking, but wittier! "Love in the time of slaughtera"? You crack me up. Bahahaha! I couldn't help myself! I want to read this book so very bad. Awesome review. I love that it reads like a movie, old horror movie, it's great. And we all need a bit of kissing among the gore. Loved this book! It freaked me out and kept me reading! The first time I read the synopsis of Ten, I thought it would read like a movie--and now I see I'm not the only one who thinks so. =) For some reason, though, whenever I see the cover, I always think of Shutter Island. LOL! I do like Scream and I Know What You Did Last Summer, but I've never read a book that is also a "Slasher". It will be interesting to see how it turns out. Thanks for the review and for the giveaway! It reminds me of Shutter Island too! (the cover, not the story) If you liked Scream & IKWYDLS I think you'll like this one too! I'd love to try and read this book! thanks for the giveaway! I've got this one on my TBR list & can't wait to get to it! I love the teen slasher movies, Scream and I Know What You Did Last Summer, so hopefully Ten will be a great read. I think I will pick up this book when I find myself in need of something like a horror film. Great review! I haven't had a really scary read in a long time. I hope this one does the trick! I definitely want to read this book! I've been wanting to read this book for awhile! I keep seeing this book on blogs and every time I am like I want this! I am glad you liked it.I can't wait to find out for myself! I've been tempted by this book because I red and loved the Agatha Christie book as a kid. I like your take on the story. Thanks. What an awesome review! I love the way you divided your thoughts up. I definitely plan to get my hands on this book at some point. I can't wait to be creeped out! Great review! Love in the time of Slaughtera hahaha! I've been wanting to read Ten for some time now. Great review by the way! I'd like a fun, quick, and creepy read! I've not read many mystery or thriller books. It's funny the way you described the lovers as finding time to make out with killings in the background! I can't wait to read that. Oh, good, I haven't read the Christie story either. I've gotta get this for my classroom. I think my students will love it!! After reading your review I can't wait to read this! Great review. I think it would be a fun read and if it reads like a movie, likely it will become one. I want to read this book SO bad! I actually did read Agatha Christie's And Then There Were None and loved it so I'm really interested to read this take on it! I heard from my friend this is a reaply creepy book a perfect time for halloween. Vengeance is probably my favourite thing ever; excited to read this! My students are always looking for scary books/ Cannot wait to tell them about this one! Can't wait to read this book and share with my students! This was a great review. I have not read this book yet and I am not sure why. This book sounds awesome. I am even in the Army of Ten with Gretchen McNeil. This review makes me want to read it even more. I think this book would be awesome! I love me some cheesy horror flicks, so it's gotta be great in book form! Great review. Loved your review, especially the "Love in the time of Slaughtera" part, LOL. 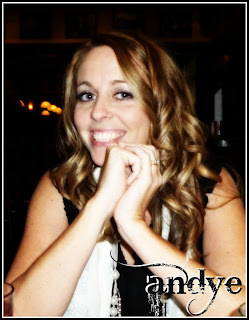 Awesome review, I've been wanting to read this so I'm glad to hear your thoughts!! Hmmm . . . I've been wanting to read this for a while. I mean like, kids all dying off on a secluded island? Duh! But perhaps while it is very enjoyable, it wouldn't be the sort of over the top "OMG I LOVE THIS" good . . . I guess I'll just have to wait and see how it is! Thank you for your review. I can see myself comparing this to Agatha Christie's masterpiece AND THEN THERE WERE NONE. It's been a while since I read anything creepy/scary...so this sounds like just thing to fill in that gap. After reading your review this book sounds like something I don't want to read when my husbans not home. Thanks for offering it for the giveaway. Can't wait to read this, sounds so creepy! That'd be a new read for me :) Thanks for the giveaway! I really loved reading your review! It sounds like a great read! Definetly adding it to my TBR list! Ohh, this sounds so interesting! Though teen angst? Eh, its a good thing I wont get that attached to them! :P I really wanna read this!